Successfully Added HK Warehouse Nomu S30 Rugged Smartphone - 5000mAh Battery, OTG, Gorilla Glass 3, IP68, 2.0GHz CPU, 4GB RAM (Black) to your Shopping Cart. With the Nomu S30 Rugged phone at your side, you are ready to conquer the wild as this Android phone is capable of handling the most demanding of environments. Its fully-rugged body has been rated IP68, meaning it is fully resistant against water, dust, and shocks. No matter the climate you’re living in – nothing will stop this beauty from working. Its stunning 5.5-inch display features Gorilla Glass 3, meaning that even the screen of this smartphone is extremely durable. Bumps, drops, and scratches – this rugged Android phone can handle it all. Running on an Android 6.0 operating system the Nomu S30 is guaranteed to deliver a smooth user experience that lets you enjoy the latest features the industry has to offer. Packing a powerful Octa-core CPU that has been clocked at 2.0GHz; this Chinese smartphone is capable of starting up the most demanding of apps in a split second. Additionally, its 4GB of RAM is there to turn this Android phone into a platform that is perfectly capable of handling the most demanding of multitasking sessions. Along with its Mali T860MP2 GPU you can be assured that all media, Apps, and games can be enjoyed in stunning detail. No matter what you throw at this powerful smartphone, it will handle it without dropping a single frame. A stunningly beautiful 5.5 Inch Full-HD display allows you to enjoy all media in absolutely breathtaking quality. Portraying great detail and vivid colors, the Nomu S30 truly lets media come to life in the palm of your hand. Supporting 64GB of internal memory and 32GB externally, this Android smartphone packs enough space for you to store all your files and media alike. Dual-Band Wi-Fi and 4G, additionally, provides you with the fastest data speeds out there, allowing you to enjoy the most demanding online media and games without experiencing any lag. No matter where you’re headed, with this Chinese smartphone at hand you’ll always be able to browse the web in lightning speeds. Packing an absolutely epic 5000mAh battery, this rugged phone delivers up to 30 hours of continuous usage time. This monstrous battery allows you to head out into the wild with confidence as worrying about battery life will be an issue of the past. Additionally, the Nomu S30 supports OTG, allowing you to turn your smartphone into a portable power bank. From now on you can be guaranteed that you’ll always pack enough juice for all your electronic devices, as with this whopping power bank at hand you can share and enjoy countless hours of power. Featuring Dual-IMEI numbers the Nomu S20 significantly increases your connectivity as it allows you to be connected to two 4G networks simultaneously. With such a broad network coverage you can be assured that no matter where on the globe you’re headed, you will always be able to stay in contact with your friends and loved ones. Additionally, this rugged phone holds a stunning 13MP camera that lets you snap breathtaking pictures – allowing you to share all your memories with the people back home once you have returned from your upcoming outdoor adventures. 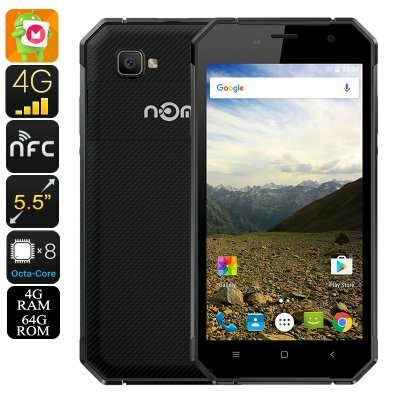 This Nomu S30 Rugged phone comes with a 12 months warranty, brought to you by the leader in Android smartphones as well as wholesale electronic gadgets..